Wild rabbit is delicious, sustainable, economical and easy to cook, and in my view, at its best in Autumn. Most good butchers will sell Rabbit, they should happily joint it for you as well. Its far more interesting than chicken and just as versatile. A delicate rabbit rillette with toasted sourdough is a true pleasure, equally, tender rabbit satay spiked with, ginger, lime and coriander is on a par. Here I'm cooking rabbit in a fairly familiar way, it’s slowly simmered with cream and rosemary until tender and giving, but just before serving salty, sweet anchovies are added. I often use anchovies in my cooking. I find they add a full depth of flavour without being over powering or fishy. They work beautifully with the rabbit, melting into the sauce as its brought to the table. Place the pieces of rabbit on a plate and season well with salt and pepper. Trickle over 2 Tbls of the oil in which the anchovies came, it will have a good flavour, turn the rabbit in the oil and seasoning. 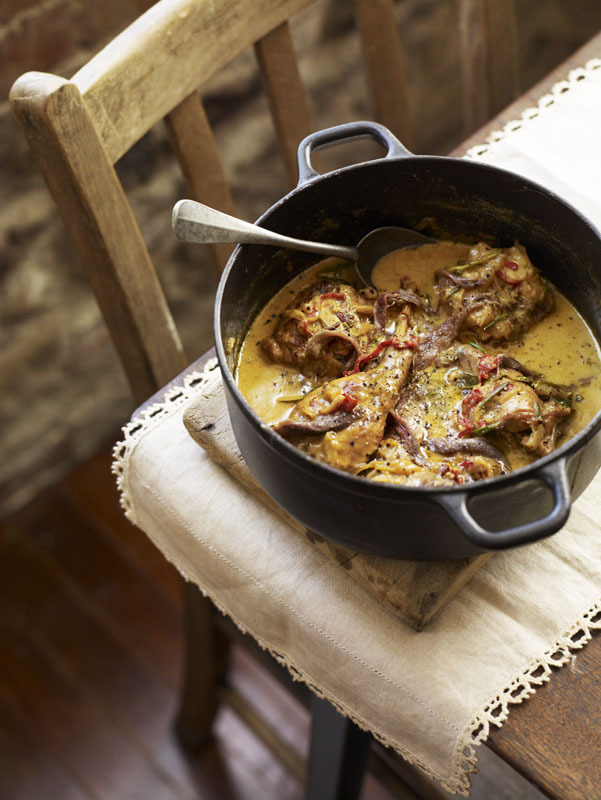 Heat a heavy based casserole dish over a medium heat, add the pieces of rabbit and brown them off all over. This will develop flavour and depth within the dish, remove the rabbit and set aside. Add the sliced onions to the pan, give them a good stir, cooking them gently for 10 - 12 mins until they begin to soften. Add the garlic and chilli and cook for 5 minutes more. Return the rabbit pieces to the pan along with any juices, add the water, bay and rosemary and bring to the simmer. Set a lid on the pan but leave it just ajar to allow some steam to escape, turn down the heat low and cook for 11/2 hours or until the rabbit is beginning to feel tender. Remove the lid and add the cream. Cook for a further 30 - 45 minutes or until the cream has thickened and reduced by at least half. When your happy with the consistency of the sauce and the rabbit is fork tender, remove the pan from the heat and allow to rest for a 10 minutes. Before serving add the whole anchovy fillets and a final seasoning. Serve with sauté potatoes, good bread and a green salad.